Draw an electric field based on a description of the charged particles. Solve problems of resistance using Ohm's law [E = IR (or V=IR)]. Solve problems related to voltage, amperage, and resistance [voltage, V = IR; series circuit formulas, RT = R1+R2 +�, IT = I1 = I2 = �, VT =V1+ V2+�; parallel circuit formulas, 1/RT =1/R1+1/R2+ �, IT =I1+I2+ �, VT = V1=V2 = �]. Build series and parallel circuits and explain how they function. Demonstrate a generated current by electromagnetic induction. 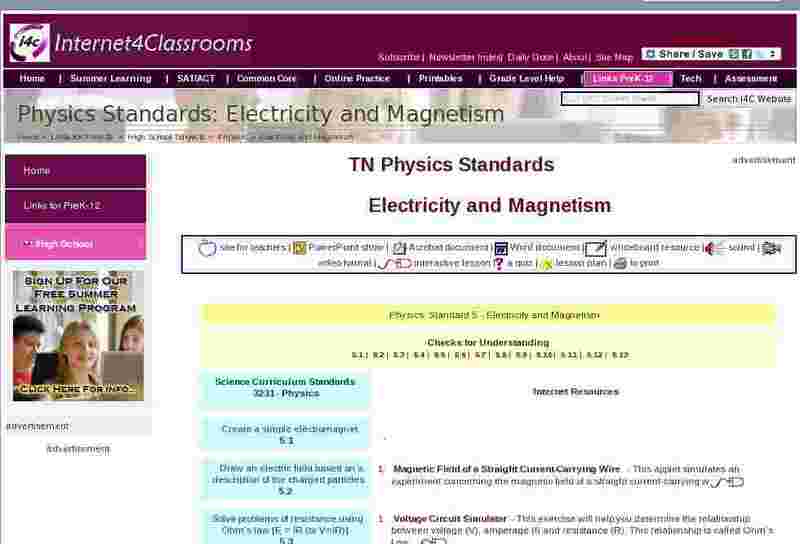 Design an experiment to demonstrate the flow of charged particles and an electric current. Analyze a group of charges for repulsion and attraction. Distinguish between charged particles related to repulsion and attraction. Describe the electric field that fills the space around a charged particle or group of charges [Coulomb�s law of electrostatics, F= k (Q1Q2)/d2]. Identify components of series and parallel circuits and solve problems related to voltage, amperage, and resistance. Describe how current is generated by electromagnetic induction.